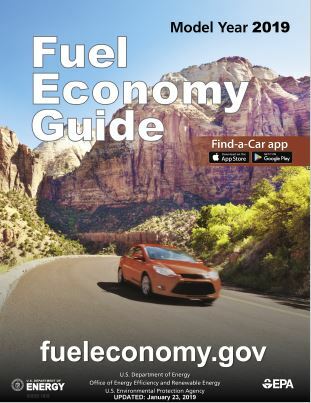 Just in time for the beginning of the new year, the 2019 Fuel Economy Guide is now available at FuelEconomy.gov. The Guide is published annually by the U.S. Department of Energy and the U.S. Environmental Protection Agency and offers data on current model year (MY) vehicles. This year’s guide provides fuel economy ratings for more than 1,000 light-duty vehicles. FuelEconomy.gov is federal government website that helps consumers make informed fuel economy choices when purchasing a vehicle and helps them achieve the best fuel economy possible from the cars they own. FuelEconomy.gov is maintained by the U.S. Department of Energy’s (DOE’s) Office of Energy Efficiency and Renewable Energy with data provided by the U.S. Environmental Protection Agency (EPA). The site helps fulfill DOE and EPA’s responsibility under the Energy Policy Act of 1992 to provide accurate fuel economy information to consumers.